Among the tiaras, necklaces, and orders that make up the bulk of modern-day royal jewel collections, you'll often find assorted sets of diamond stars. Sometimes they are worn on their own as brooches or hair ornaments; sometimes they're affixed to tiaras or necklaces. The nineteenth-century fashion that led so many royal families to acquire these star ornaments can be traced to one influential source: Empress Elisabeth of Austria, better known by her nickname, "Sisi." Sisi's stars were made for her by Köchert, the imperial court jeweler. She ordered at least twenty-seven diamond and pearl stars from the jeweler herself . Each of the stars is ten-pointed, and each features a single pearl set in the center of the design. Compared to the enormous, elaborate crown jewels of the period, these ornaments were small and probably seemed rather insignificant. But when Sisi posed for painted Franz Xaver Winterhalter in 1865 with the stars scattered throughout her famously lush hair, she started a fashion trend. Biographer Brigitte Hamann notes that Sisi also made a splash by appearing at various public events, including a court ball in Dresden for the wedding of her brother, wearing the glittering ornaments in her coiffure . These public appearances, combined with the popularity of reproductions of the Winterhalter portrait, sent other European royals hunting for diamond star ornaments of their own. Garrard supplied diamond star ornaments to Alexandra of Denmark, then Princess of Wales, across the channel in Britain. She often wore her diamond stars on the bodices of her gowns, as seen in the photograph on the right. She also used some of her stars on the diamond tiara that had been a wedding present from her husband . Even more diamond stars were added to her collection in 1873, when an Indian shield was broken up by Garrard to produce the ornaments. 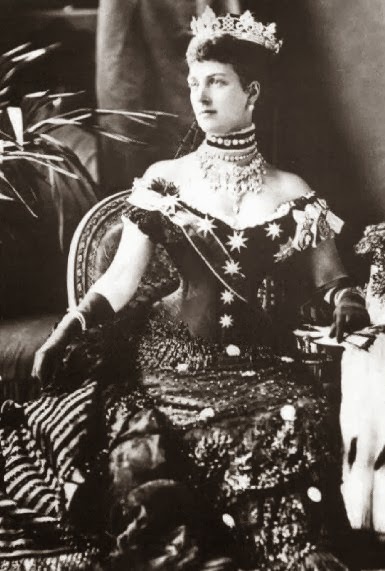 Although Sisi is generally credited with launching the fashion for diamond stars, some think the trend might have died out had Alexandra not continued it . One of the most impressive examples of a nineteenth-century diamond star jewel is the Diadem of the Stars, which today is housed with the collection of crown jewels from the former royal family of Portugal. It was constructed for Queen Maria Pia of Portugal in 1863, at the time when Sisi's stars were becoming a matter of public fascination . It also features a coordinating necklace. 1. Detail of Franz Xaver Winterhalter's 1865 portrait of Empress Elisabeth of Austria, available via Wikimedia Commons; source here. 2. See "The World of the Habsburgs" for more. 3. 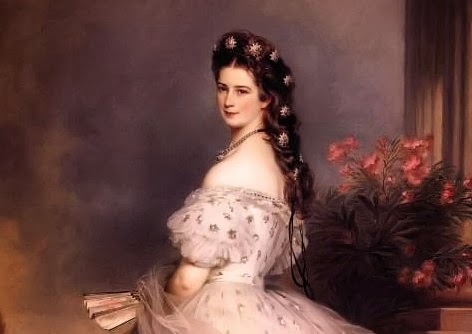 See Brigitte Hamann, The Reluctant Empress: A Biography of Empress Elisabeth of Austria (2012). 5. This is the tiara often incorrectly referred to as the "Rundell" tiara; it was made by Garrard, not Rundell & Bridge. See A Tiara a Day and The Queen's Diamonds (Roberts). 6. See Ursula's website for more on these claims. 7. See John's website for much more detailed information on the various diamond star sets owned by the Dutch royals. 8. See this post from A Tiara a Day for more information. 9. Cropped version of photograph available via Wikimedia Commons; source here. 10. For much more on the theft and recovery of the diamond and pearl star, read here and here.